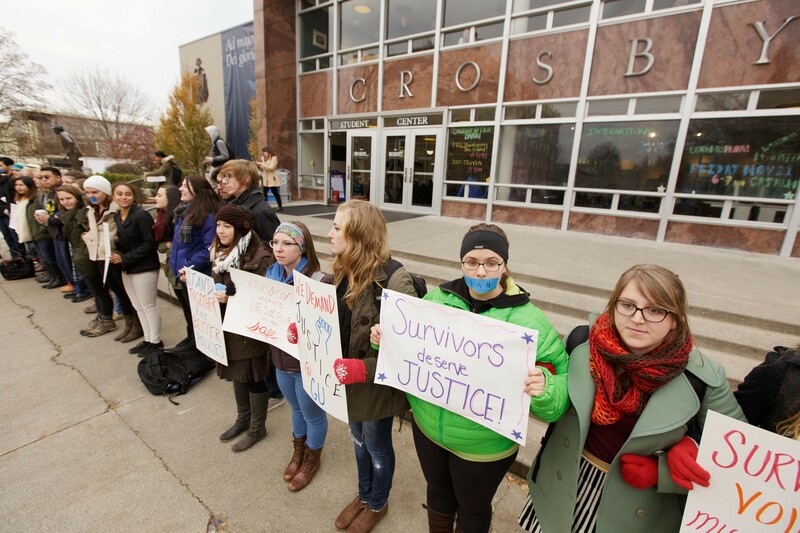 About 40 students demonstrated at Gonzaga this week to call for changes to the school's sexual assault policies. After two weeks of students calling for changes to the way the school addresses sexual assault, Gonzaga University's Title IX coordinator, who handles all reports of sexual assault on campus, has resigned. The school's human resources department confirmed that Sarah Green resigned Wednesday and "has left the university," but would not provide any more details. Green's voicemail now directs callers to the assistant director of human resources, Gretchen Stoup, who will temporary fill the job. Eric Baldwin, who oversees student conduct and counseling as the dean of student well being and healthy living, said he found out about Green's resignation today and has "absolutely no context" about why she left. Leaders of the student group that's been organizing on campus — we wrote about them this week here — say they found out about Green's departure when they were told she wouldn't be attending a panel discussion tonight being put on by the student group Students Advocating Sexual Health Awareness. The students were also given "absolutely no details" about her resignation, but quickly emailed Baldwin to ask for student involvement in the hiring of her replacement. "There's a general feeling of we don’t really trust the administration. We've seen people be silenced, we've seen things mishandled, and we want to have a stronger voice in how things are dealt with to restore trust," says Meg Besch, one of the leaders of the student movement. "Having a voice in hiring the person creating the policies that keep us safe or don’t keep us safe is something that needs to happen." Baldwin says he will lobby the administration to involve students as a search for Green's replacement begins. Meanwhile, he says, his office will continue to work with them on the changes they hope to see to the way the school handles reports of sexual assault and supports survivors. The hiring of a new counselor and changes to the counseling intake process have decreased wait times for students in need of those services, he says. (Students complained that they had previously been asked to wait two months for counseling. As of today, there are no students on the wait list for counseling appointments, according to Baldwin.) The school is also close to finalizing a contract with nonprofit Lutheran Community Services to provide a victim advocate on campus. A victim advocate, unlike a Title IX employee, is not required to report instances of sexual assault if the victim doesn't want to report or wants to do so anonymously. Anyone hired by the university is subject to Title IX rules, but using a contract would allow an exemption for Lutheran's employees and a new resource on campus for students who've experienced sexual assault. Baldwin says he expects that contract to be finalized by next week. Along with those changes, the students are still calling for more, including an on-campus survivors' support group and harsher penalties for students found to have committed sexual assault. Besch, the student leader, says her group met once with Green and she seemed open to their ideas, but "we don't feel like [her resignation is] going to hurt our momentum." "That's not something we're going to allow to happen," Besch says. "We're going to keep pushing to get the changes we think we need here." Can a group of students convince Gonzaga to change the way it handles sexual assault?